Ozone is a gas that normally exists in the atmosphere and is produced by the effect of UV rays of sun’s light on the oxygen. Medical ozone is the mixture of oxygen and ozone, in variable concentrations according to how it is applied. Ozone Discectomy (or ozonucleolysis) is a procedure used to relieve back and leg pain by the injection of ozone in and around the disc. This procedure is an extremely effective alternative to surgery for the treatment of back, leg or arm pain caused by a herniated or a prolapsed lumbar or cervical disc. Over 3,000 patients have been treated successfully at our centre using injection of medical ozone in the disc with a success rate of 70-80% and with minimal or no complications. Ozone discectomy is done under local anesthesia and the patient goes home after a short recovery on the same day. Ozone therapy due to its good results, noninvasiveness and lack of major complications compared to other methods (microsurgery, endoscopic discectomy, percutaneous discectomy, conventional open surgery)make this therapy the treatment of choice with the potential to change lives of countless sufferers of back and leg pain. When Ozone is injected in the inner disc space (nucleus pulposus, there is a production of antioxidant enzymes. These neutralize the toxic materials present inside the inner disc space and cause shrinkage of the disc. Further, Ozone dissolves in the water in the disc and affects the proteoglycans which are the building blocks of the disc causing them to shrink thus reducing the disc volume and lessening the pressure on the nerves. 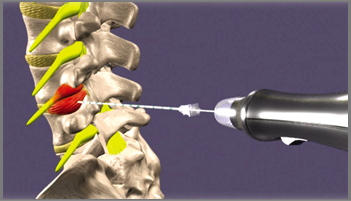 Ozone injections have been found to be an extremely safe form of treatment and are currently employed in Europe as the first treatment of choice in disc herniations. The treatment is by and large free from any side effects . What are the benefits of Ozone discectomy? Who should not consider it? What is the course after the Ozone treatment?